The father-of-one was then told he’d have to catch a later train and he was eventually forced to take a bus home. 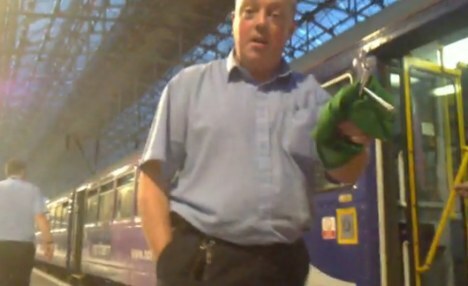 Mr Khaliq’s problems began when he tried to catch a train from Manchester’s Piccadilly station to nearby Guide Bridge station, which is close to his home in Audenshaw. He had deliberately arrived ten minutes before the train’s departure on Saturday so he could get help with boarding. Mr Khalik said: ‘I always arrive at least 10 minutes early to ensure I can get helped on the train without a problem. ‘There were no platform staff around and I could not see a train guard. ‘A passenger on the train got up to help me and knocked on the guard’s window to say there was a man in a wheelchair who needed help. ‘He yelled at me as I left saying the police would be coming and they would take my mobile phone off me for filming it,’ he added. Peter Myers, a company spokesperson, said: ‘We help anyone who needs assistance. ‘That’s why we have ramps on our trains and that why we have ramps at our stations too. He said: ‘I have got a wife and a young daughter and we need to go out. A spokesman for the Muscular Dystrophy Campaign, who published a report last year highlighting the problems faced by disabled people on public transport, said: ‘Unfortunately these problems are all too common. ‘This is having a serious effect on the independence and quality of life of disabled people not only in the north west but across the country. Previous Should DPO Waqar Ahmad Chohan be executed along with the Mob Leaders? Next £45,000 taken from underpants!